We designed Pinell GO for optimal use of the new DAB broadcast net- works available in an increasing number of countries. 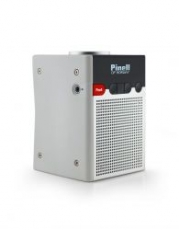 As always, we’ve specially designed the speaker driver and amplifier to ensure the great sound you expect from Pinell. The built-in battery provides well over 24 hours of playback. We expect you to fall asleep well before the radio does! Pinell GO plays FM as well. So you can listen to all your favourite local radio stations.